It may or may not be a coincidence that the two people most responsible for making the Prog and Meg come to life each week/month happened to start work at around the same time. (One imagines the move from Egmont to Rebellion at around this time had something to do with it.) I’m sure there’s room for debate about who has put in more creative and/or physical labour, but few would deny that this duo has overseen a gloriously long stretch of greatness, a stretch that is going strong to this day. Well, technically, none – but it’s for certain that Smith has commissioned series, strips and maybe even characters that other creator droids, who brought them to life, would not have come up with on their own. I hope he gets some kind of remuneration for this, along with the occasional warm glow of satisfaction. Realm of the Damned - and Parr can count also the current incarnation of the Nerve Centre pages, and of course the Prog and Meg logos as his creation, and perhaps some earlier versions, too. And likely a bunch of strip logos, too? The sort of people who are into 2000AD enough to read blogs like this one love a good logo, don’t they? Maybe it’s Stan Lee’s fault for inspiring the cult of the writer/editor as king in the world of comics in the 1960s, or maybe it’s just that the job ‘designer’ hasn’t really come into common consciousness until the turn of the millennium, but if Tharg warped his way to Earth today, I reckon he’d style himself ‘Chief Creative Officer’ or somesuch term that allows him to take credit for both the words and the pictures. But, as it was in 1977, Tharg described himself as an editor, and as such is linked to the editorial droid in charge of putting together the weekly Prog. But it was never that simple. The look of the Prog has always been essential to its enduring popularity. 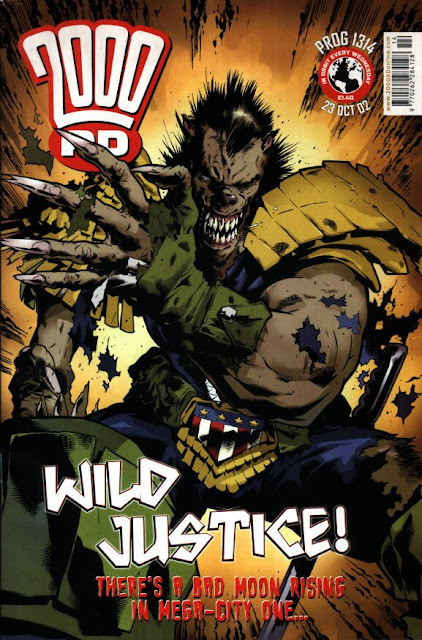 Even the mighty Pat Mills, creator (original editor and lead writer) of 2000AD, is quick and insistent to explain the vital contribution that IPC design bod Doug Church made to the initial wave of Thrill Power. And few readers who go back to the early Progs (and StarLords, for that matter) can fail to spot the key involvement of a young Kevin O’Neill tinkering away with the layout of those fiddly pages in between the strips, and those ever-pesky beasts, the front cover and the Nerve Centre. Although it’s surely the stories within the pages of 2000AD that keep readers coming back, one could argue that the essence of those stories has not changed all that much in 40 years – while the style of the comic has had to adapt quite a bit to draw in new readers. Is it Tharg in his design droid iteration who carries more of the risk? So much for the preamble, what about Messrs Smith and Parr themselves? I mean, what have they ever done for 2000AD? Smith has, technically, a single strip writing credit (that counts towards this points tally): the Dredd movie prologue, featured in Meg 328. A solid outing that shows how well he understands Dredd – it was designed to tie-in with the movie version, and does so brilliantly, but also feels in keeping with the beloved comics iteration of Dredd. a) the Prog has not seen any of those mid-series hiatuses and hurtful delays that seemed to plague 2000AD in the late 80s and early 90s. b) he’s maintained an incredibly high hit rate of thrill power by cultivating long form storytelling over multiple series, using a dependable a mix of old characters, new characters, and occasional revamps of ancient characters – basically being all things to all readers and somehow making it work. All this adds up to fans consistently describing the last decade's-worth of Prog's being a new Golden Age for 2000 AD. Certainly the letters pages and online forums are full of lapsed readers picking up a newer Prog and rediscovering all that they loved about the Galaxy's Greatest comic. It's a good time to be a Squaxx dek Thargo. It's hard to find relevant images for Smith's input, so instead I'm showing this, one of the finest Prog covers, and part of a storyline that clearly inspired a young Smith into a love of all things Dredd. He's even written his name on the side. Smith steers wisely and efficiently clear of sexual overtones by inserting the word 'pantry'. I don't want Smith to stop being Tharg, but at least there's the hope of solid writing should that black day come to pass. Parr has the edge in terms of credited creative contribution. He’s got 8 covers to his roster (including a one of my all-time faves on 1605, for, of all things, the space prison serial Stalag 666). He even has a writing credit as well as strip art credit, and, doubtless due to the dreaded deadline doom, a whole host of lettering credits. And now of course we have Realm of the Damned, a divisive but, for this reader, glorious gore-filled romp. Without having any knowledge of the death / black metal scene, I'd have thought the expected style for a strip like this would be painted, along the lines fo a Dave Kendall, Nick Percival or of course Simon Bisley. Parr keeps it with a clean line, and perhaps a hint (only a hint, mind you) of the wood-cut feel from McMahon's Slaine days. I find it makes the gore more palatable, although it retains a serious tone that scripter Worley is surely aiming for. I mean, you can't take it seriously on one level, but then what if you could? What if there really were demon overlords with devoted human followers? It would look a bit like this, don't you think? That's some serious face-ripping horror right there. A list of names to be proud of, and an era of glory to cherish for 2000 AD fans. And what about their work on the Judge Dredd Megazine? Parr has now worked on 163 individual issues (so far!) 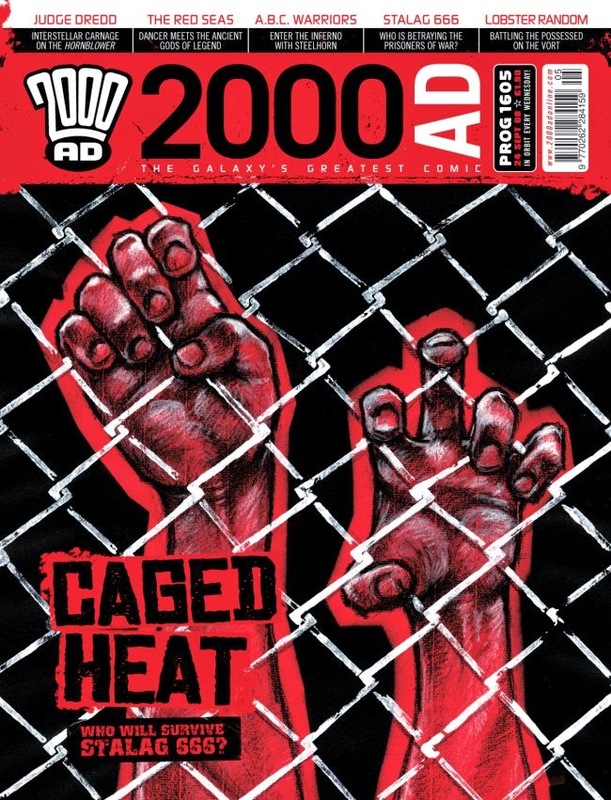 of the Judge Dredd Megazine – more even than even David Bishop, which is saying something. Smith is barrelling towards that figure, too, although he’s a way behind Bishop. 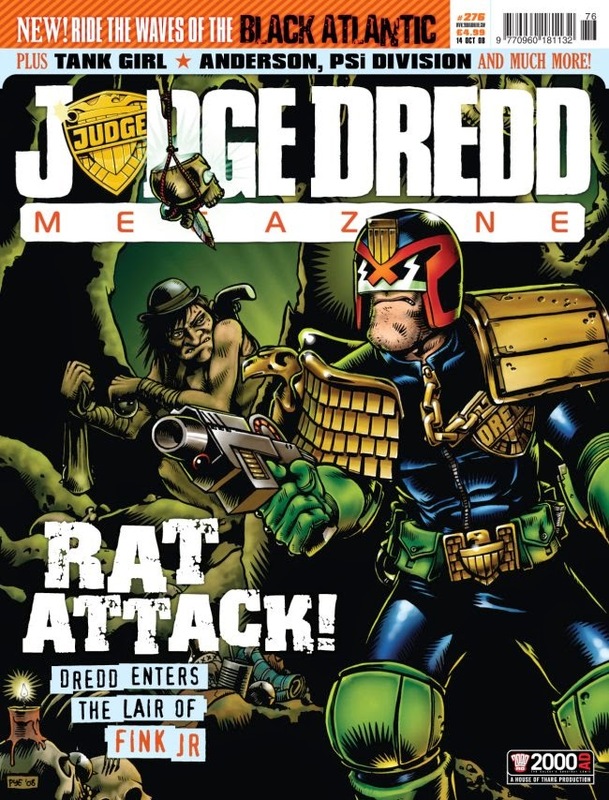 In their tenure, the Meg has continued its reliable mix of consistently high-quality Dredd stories, returning old characters, new series (including two of the best Meg series of all time, Insurrection and Lawless), creator interviews, text pieces, and, best of all, a fantastic training ground for new talent (Arthur Wyatt, Michael Carroll, TC Eglington, Jon Davis-Hunt have all benefited hugely; let’s not forget that Tales from the Black Museum began only under Smith’s tenure – I’m assuming it was his idea – and it functions superbly as a Future Shocks style breaking in opportunity for new droids, as well as being reliably fun). I’m assuming it’s also Smith, in particular, who has control over the reprint section of the Meg. I’m not thinking of the bagged reprint booklet, which I suspect is someone’s else’s area to curate. I’m talking about those non-Rebellion commissioned strips that appear in the Meg. Or, as I like to think of it, the chance to read stories that I would never otherwise have heard about, let alone seek out. For me, this goes all the way back to Preacher, but I’m thinking more recently of Lilly McKenzie, Numbercruncher, Ordinary and Man from the Ministry – four of my favourite ever strips to run in the Megazine – that all feel naturally at home there whilst being, technically, created to run in other sources. If the promise from Smith of a berth in the Megazine was even partly responsible for motivating the creators involved to make those stories, that’s worth a big thank you. Finally, it would be very remiss not to spotlight the latest epic reprint series, Judge Dredd the Mega Collection. Smith has the incredibly envious but also very difficult task of deciding which Dredd stories, in which order, tell the story of Mega City 1. The sort of project where the inner fan takes over, but the outer editor has to have a firm hand to keep it accessible. Parr, meanwhile, is caning it on the cover deisgns. Lush on the inside, lush on the outside. 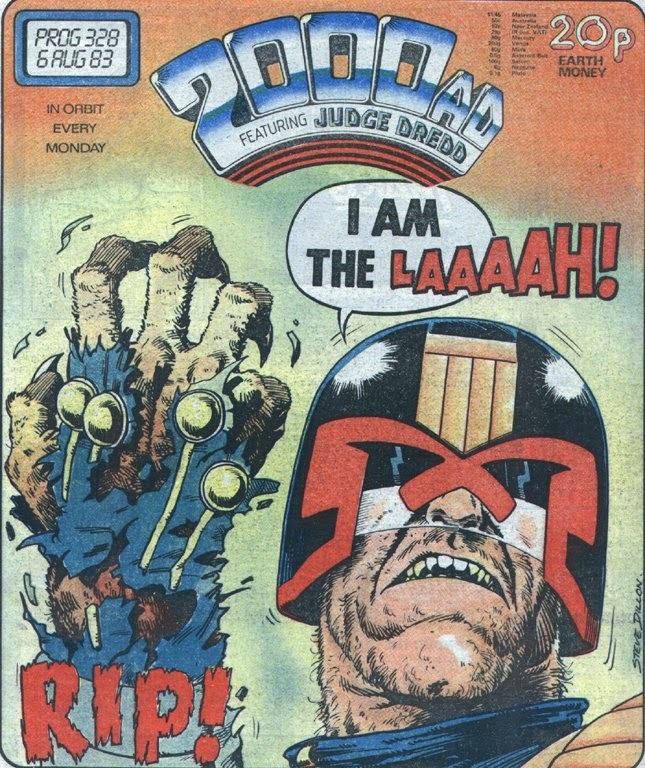 Art by Colin MacNeil, Carlos Ezquerra and Brian Bolland. *full disclosure – I applied for the same ‘editorial assistant’ job that Smith, and no doubt lots of other squaxxes, applied for back in the year 2000. Jealousy aside, I’m sure glad Tharg picked the right droid for that position! **Given name ‘Simon’, but he appears to go by Pye. I assume he prefers it that way, too! ***I’m making some pretty gross assumptions here, and I apologise if I’m way off the mark. I’m assuming that Rebellion’s design team functions in largely the same way to the design dept. in my office (I work as an editor for a children’s publisher†, and yes, we produce the odd bit of comics, and yes, some panels always need redrawing). ****Yes, many of these people had worked for Tharg before the Smith/Parr era, or had made a name already in other comics. Certainly credit for giving them work in the first place may well properly belong with David ‘champion of new talent’ Bishop and Andy ‘shot-glass of rocket fuel’ Diggle. But I think Smith/Parr deserves the lion’s share of respect for giving these creators a chance to try and try again until masterpieces of story and art were, and continue to be, delivered. *****News as of Prog 1931 and Meg 360 reveals that Pye Parr is leaving the fold. Farewell and thanks for all the logos, Pye. † I promise to stop banging on about this. One day.